If you’re a military member with security clearance, you may be aware of a recent change that the Department of Defense (DoD) is now enforcing. Specifically, the DoD has been instructed by the president to “continuously” monitor personnel with security clearance. While this “monitoring” encompasses several different things, one important aspect of this new policy that military members should be taking stock of now is their financial history. Yes, the DoD will be regularly monitoring the likes of credit scores and credit reports for any warning signs that could draw concern. So if you’re a military member that has access to classified information, it’s time to brush up on your credit report, aim to lower your debt-to-credit ratio and commit to better meeting your financial obligations (if you don’t already do so). Failure to do so, and you could lose your access and potentially derail your career. 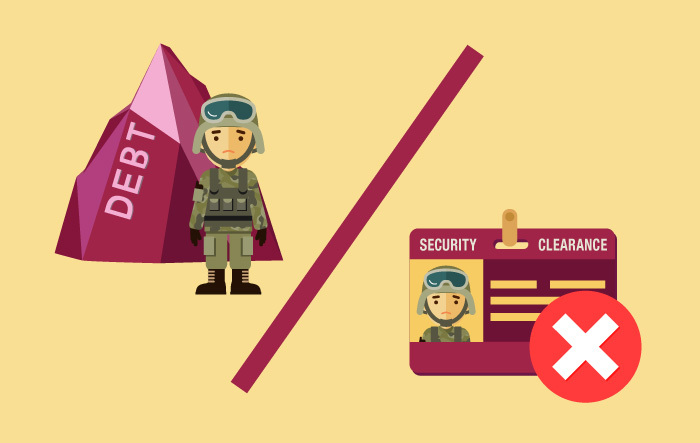 This post will take a closer look at the steps military members with security clearance should take to ensure that they are in good credit and financial standing. Check your report: Here’s something that everyone should know: You’re entitled to one free credit report annually from each of the major credit bureaus. It’s important to make sure that you’re taking advantage of this for several reasons. One, it gives you a good idea of where you stand and what work you need to do. Two, it can help you detect and dispute any errors that are on your report. The latter point is especially significant, especially when you consider that as many as one-fifth of all Americans have some sort of error on their credit report. So even if you’re in good credit standing, make sure you pull your report to see if there are any inconsistencies. Sign up for fraud alerts: One nice thing about the new guidelines that will require continuous monitoring of personnel with security clearance is that as of May 2019, service members will be able to enroll in complimentary credit monitoring and fraud detection. Until this new policy takes place, however, service members might consider contacting the credit reporting bureaus and ask them to freeze their credit. Freezing credit essentially means that nobody will be able to open a line of credit under your name until you un-freeze it. It provides an extra layer of security and peace of mind. Commit to good debt management, credit practices: As we stated in the opening, anything that raises eyebrows during the DoD’s continuous monitoring has the potential to be detrimental for active service members. That said, if you haven’t already done so, now’s the time to commit to good debt management and credit score practices. Make sure that your bills are paid on time, try to keep your debt-to-credit ratio at or under 30 percent, wisely open and close new and existing accounts, respectively, and make sure that you’re regularly checking your credit score and annually pulling your credit report.